The commute times are lengthening in the North Bay. The unfunded Marin-Sonoma Narrows widening project on Highway 101 causes long delays every day for commuters, goods movement and visitors. The two lane Highway 37 is gridlocked most of the day and was closed for almost a month due to flooding which will worsen as sea level continues to rise. In Marin, the freeway is backed up from the lack of metering lights and interchange improvements. Local roads are in disrepair, with road money inadequate to maintain the existing infrastructure, even with the infusion of SB 1 funding. 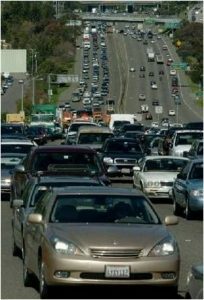 These transportation nightmares threaten the North Bay economy and public safety. As regional commutes become longer and more difficult, employers experience a shrinking labor market from which to draw the talent on which they rely, making the North Bay area a less attractive place to launch or expand a business. Companies must go where the talent is and if the talent can’t get to the North Bay, the companies will go where that talent is. Unless addressed with urgency, growing commute congestion and delay will inevitably slow economic and job growth, limiting its expansion throughout the Bay Area and its benefit to residents and governments. Transportation planning and funding processes are not oriented towards rapidly addressing the urgent crisis that the North Bay is facing. Transportation planning typically addresses a very long horizon, with Regional Transportation Plans measuring their success against outcomes 20 or 25 years into the future and capital improvement projects taking ten or more years to deliver. Factor in the chronic shortage of funding for transportation, and it’s clear that business-as-usual approaches will not yield the results that our economy needs. Protect taxpayers’ investments with strong accountability and reforms. Focus state funding on maintaining and rehabilitating the current transportation infrastructure.